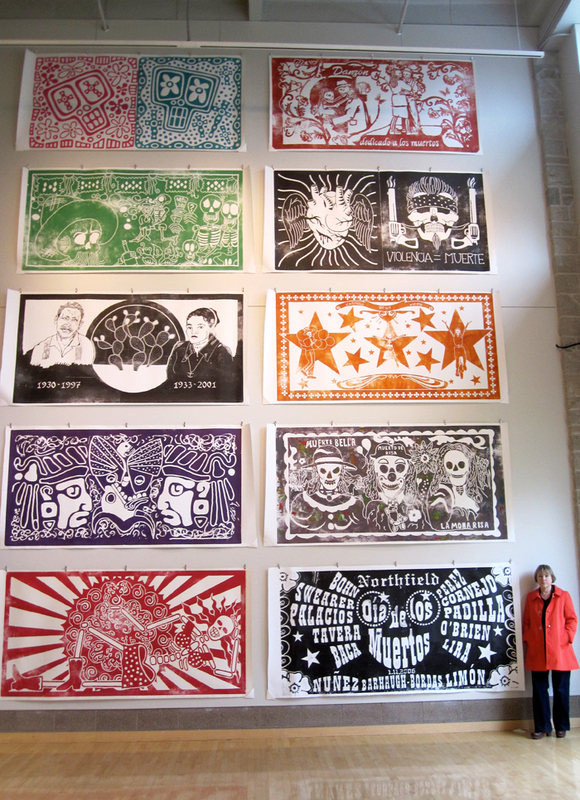 Grupo Soap reprises its "zine" publishing of 2015 with black and white works by an international group of mostly latino artists. Please join us for an Artist Panel Discussion focusing on the role of art in the Midwest reflecting culture, migration and borders. The panel will be composed of University of Minnesota Chicano and Latino Studies professor Karen Mary Davalos (moderator) with participants from the Grupo Soap del Corazón monoprinting workshop at Segura Arts Studio in South Bend, Indiana held in April 2018. Artist panelists include: Olivia Levins Holden, Dougie Padilla, Maria Cristina Tavera, and Xavier Tavera. More Information about "Espejos y Reflejos / Mirrored Reflections"
Special thanks for their support: Humanities Without Walls, Inter-University Program for Latino Research, El Colegio de la Frontera Norte, and the National Association for Latino Arts and Culture. Open one hour every Sunday after the 11 am morning services (12pm - 1pm) through May 13. Tuesdays and Wednesdays by appointment. March 25, 12:00pm Dougie Padilla and Xavier Tavera will speak about the Project. Grupo Soap del Corazon celebrates 16 years of art making and exhibiting with a show of 16 artists at the Franconia in the Cities gallery in NE Minneapolis. Why "Casa Magica"? 3) and because artists make art as a way tocreate a magical experience for others. Artists' talk is Friday, October 8th, from 7:30-8:30. The first short film by latino artists Los Hermanos Flores, Xavier Tavera, and Dougie Padilla. Goats in woods become avid fans of performance and poet Ted King, Singer-songwriter David Ballman, and dancer Lela Pierce. Background performance energy by goat whisperer Stewart Turnquist.